I’ve been dreading this day for a year. The first anniversary of saying goodbye to Grace Pearl. A year ago today we arrived at a hospital in the pre-dawn hours of the morning and grimly walked into its labor and delivery ward. I had been warned that this might be especially hard emotionally by our doctors, but we opted for the hospital over Planned Parenthood because of my advanced stage of pregnancy: I could get more anesthesia there, would have more privacy, and as it turned out they recommended, an epidural. The doctors were the same at both places, so there was no advantage there. I was also grateful for the lack of protesters as I walked into the hospital; I had heard (and had seen) that people protest Planned Parenthood. I wondered what they’d say to me if they knew our story. After changing into my gown and having IVs administers, I was given a pill to tuck into my cheek that would further the softening of my cervix. My doctors and nurses checked on us frequently advised that I get an epidural over full anesthesia for my safety (I agreed), and and assured us that they’d do their best to get hand and foot prints from Grace, and asked if we wanted to record her heartbeat. I had done so badly on my phone about a month prior using my home Doppler, so I declined this – I just didn’t think there was any way I could emotionally handle it. My home recording would be sufficient. After a few hours it was time to go to the operating room and have the procedure done. I was so nervous going into it I started dry heaving and was sent down the room with a bucket in case I did throw up. Once we were in the room they had me sit on the edge of the operating table, hunched over while they administered the epidural, and I noticed a man sitting in the far corner. I asked if he was the doctor that would be doing the procedure (he was the only one we hadn’t met yet), which he confirmed he was, and right then the IV of relaxants, for lack of better term, started. I remember gushing out to the operating room that I had wanted my daughter, that we were doing this out of love. They promised again that they would cut her umbillical cord before doing anything else, and they were tender and compassionate. I was in and out of consciousness for the procedure, which only took 15-20 minutes. I found myself wishing they had fully knocked me out, but also feeling grateful that I could be somewhat present for the end of Grace’s time with me. I had been advised to bring headphones and music, and I got through 4 songs of her playlist: I think they were “Born To Run”, “Sittin’ On The Dock of the Bay”, “Let’s Spend The Night Together” (which I always thought was a hilariously awkward choice, but also what we’d do for many nights of her newborn and baby life) and “Superstition”. I loved the idea of Grace and I listening to the same songs at the same time, and her heartbeat ceasing while in the warmth of my body, literally enveloped in love, hearing music tenderly chosen by her father to say goodbye. The next several hours were a blur of being freezing cold, being heaped with heated blanket, sleeping, and brief moments of doctors checking on me, pressing on my now empty abdomen. I felt around for Grace, and mourned for my now missing baby bump. It had never been big – we later learned because of the lack of amniotic fluid and how tightly curled up she was, but I was still acutely aware of what was gone. A chaplain came in and Jim had a long talk with her about God, Grace Pearl, and our decision while I slept. 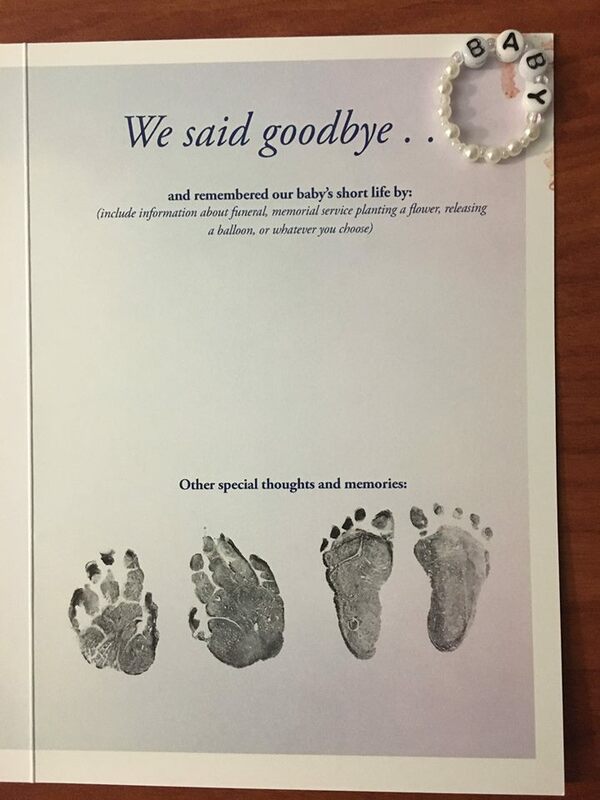 We were given hand and footprints (both which I realized looked just like Jim's which simultaneously filled and broke my heart), and a little bracelet Grace never got to wear that said "BABY". It was hours later when I was discharged to go home, after I had crossed off all of the checkboxes that the hospital required. We left in much of the same way we’d arrived: the sun was again tucked away, and Jim and I quietly and awkwardly stepping through everyone else’s lives as they continued on with the laughs, smiles, plans and jokes while we wondering how the world hadn’t stopped after such a terrible blow. As we drove off into the dark, back down to a family of two, I wondered how we’d get through Thanksgiving the next day, and then the day after that, and again after that, without Grace.